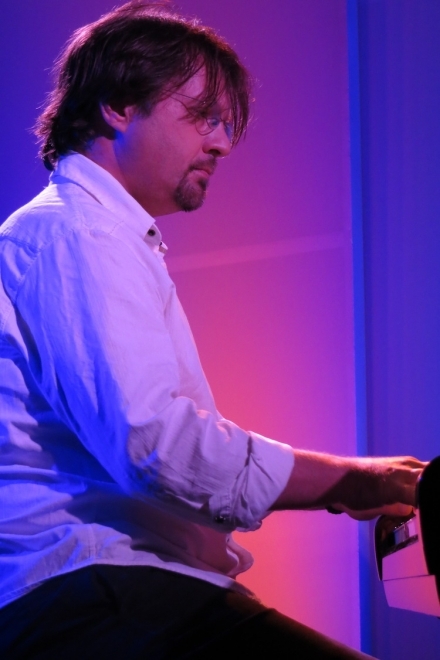 Fresh from a three-city concert tour of Russia this past January, pianist/composer David Hicken will return to Florence for a solo piano concert in the home of local piano teacher and owner of MainlyPiano.com, Kathy Parsons, in Sandpines West. The concert will be on Sunday, March 3rd at 3:00 PM (3/3 at 3!). Trained as an organist from an early age in England, Hicken switched to piano early in his career. He has released ten solo piano albums and four organ albums with more on the way. Hicken left England at the age of seventeen to study at the Peabody Conservatory of Music in Baltimore and has performed in concerts internationally. Although his music is often difficult to categorize, Hicken’s love of the music of JS Bach and other classical composers often makes itself heard in his music. From tender and delicate to bold with a lot of bravado, David Hicken is a pianist/ composer who knows no bounds and has the technical ability to play just about anything he can imagine. David last performed in Florence in March 2015 to a wildly enthusiastic audience. He doesn’t perform in concert often, but his longtime friendship with Kathy Parsons will again give the people of the Florence area the opportunity enjoy the music of this exceptional artist in an intimate setting. There is a suggested donation of $20 at the door. Reservations are required and can be made by calling Kathy Parsons at (541) 999-9720 or emailing her at kathypiano@gmail.com. The address and directions will be given when reservations are made. CDs and sheet music will be available and can be autographed by the artist.